Obamacare barely survived 2017. How's 2018 look? WASHINGTON — After a year in which Obamacare's fate hung by a thread, 2018 is likely to feature fewer mortal threats. But the next 12 months could still be a tumultuous period as insurers, customers and elected officials react to major changes to the law by the Trump administration and the Republican Congress. Republicans tried without success throughout 2017 to repeal and replace Obamacare, but there's little indication they plan on pursuing another serious push next year. "I think we'll probably move on to other issues," Senate Majority Leader Mitch McConnell, R-Ky., told NPR last week. Instead, the Affordable Care Act, which Trump has pronounced "dead," "finished," "gone," and, as he put it earlier this month, "essentially repealed," continues to chug along. About 8.8 million people have signed up for 2018 coverage through HealthCare.gov, only a modest decline from the previous year despite a 90 percent cut in advertising by the administration and an enrollment period that was half as long. Insurer profits improved, suggesting companies have learned to price plans better. Millions more continue to get care through the law's Medicaid expansion. 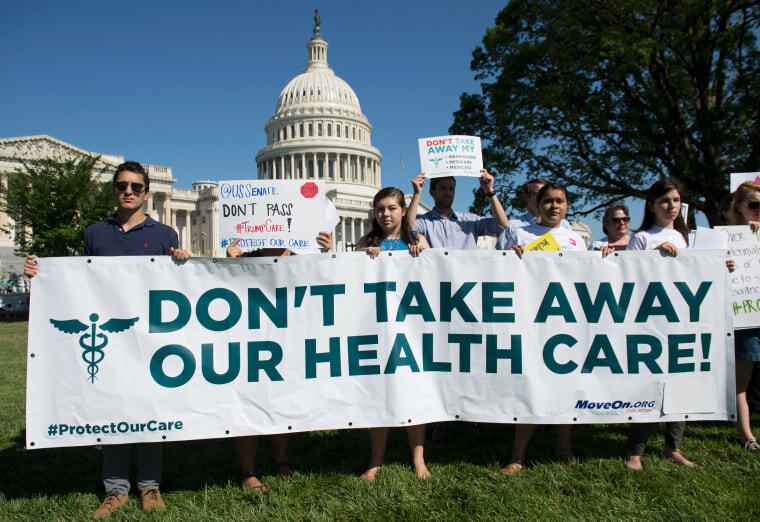 "The ACA is living and breathing right now, which was hardly the expectation a year ago when Republicans took control of the federal government," Larry Levitt, senior vice president for special initiatives at the Kaiser Family Foundation, said in an e-mail. But the law's insurance exchanges are also fragile and face big changes next year. The new tax bill eliminates the individual mandate, a key pillar of the ACA. Trump's White House is pursuing new regulations that could undermine Obamacare plans with cut-rate alternatives. Some states are struggling to attract insurers, a problem that's carried over from the Obama era. Republicans are still debating whether to give the ACA a bipartisan tune-up or purposefully "let Obamacare fail," as the president has put it. And nobody is sure what surprises the year might bring. "The individual insurance market is one big question mark right now," Levitt said. At the time it was passed, the mandate was considered a critical part of the law's protections for people with preexisting conditions. The goal was to push more young and healthy customers into the system to offset the cost of sicker patients insurers would now have to take on. Without the mandate, the Congressional Budget Office estimates that 4 million more people will go without insurance in 2019 and 13 million after a decade, while insurance premiums shoot up 10 percent annually. Health experts are watching the mandate change closely, but they're not sure how much it will affect the insurance market. Some analysts already viewed the mandate as too weak to achieve its intended effect and insurers may have already priced in the assumption that they'll have fewer healthy customers than expected when the ACA passed. Deep Banerjee, an analyst at S&P who tracks the insurance industry, said he expected higher premiums without the mandate and potentially some loss of customers and insurers, but not "mass exits" from the market. "Looking forward to 2018, I'm not expecting any meaningful increase or decline (in enrollment)," Banerjee told NBC News. "What that means is the market seems to be stabilizing at this level." While the mandate's full impact isn't yet known, insurers have not taken well to unpredictability in the past. The change, along with other moves, will add more of it in 2018 as insurers decided their rates for the following year and whether to participate in Obamacare's exchanges at all. Last year, providers cited confusion over GOP repeal efforts and Trump's threats to cut off cost-sharing reduction payments (CSR), which he did in October, in announcing higher rates and pulling out of some markets. The CBO credited "short-term uncertainty" with driving premiums up 15 percent. Adding to the confusion next year, the Trump administration is considering new rules, which could take months to develop and finalize, that would allow people to buy less comprehensive short-term or association plans. This could siphon more young and healthy customers from Obamacare's exchanges, which could further raise premiums and potentially spook more insurers away from the exchanges for 2019 enrollment. "I think there’s a lot of uncertainty remaining in the market and that's something that some insurance companies may find they can no longer tolerate," said Sabrina Corlette, a research professor at the Center on Health Insurance Reforms at Georgetown University. The result could be to worsen an already large divide in Obamacare's exchanges between lower-income and higher-income customers. Most Obamacare customers qualify for subsidies that rise with premiums, meaning they won't feel the effects of rate increases. But customers who make too much to qualify for federal help, which cuts off at 400 percent of the federal poverty level, face much higher premiums and could struggle to find a plan they can afford. "I think very quickly those folks will be priced out of coverage if they haven’t been already," Corlette. Sen. Susan Collins, R-Maine, tied her vote for tax cuts to assurances that Republicans would consider bipartisan bills to help shore up Obamacare's markets. But passing either bill would require Republicans to declare a temporary truce in the Obamacare wars and risk being tagged by conservatives with "bailing out" the law. Trump himself has seemed torn over the issue, initially encouraging talks on Alexander-Murray before abruptly rejecting the bill. What is clear, though, is that Obamacare's status remains highly unsettled heading into the new year.